I've always wanted to make a french toast casserole, but when we have company over for breakfast I always seem to forget about it and we just do a big messy eggs/omelet, pancake, and bacon breakfast. Well, back in Aug we had some family staying over for the weekend. 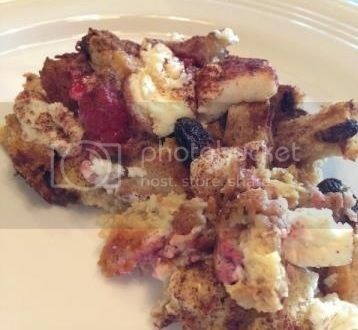 They came over for my baby shower and were only over for one morning (the morning of the shower) and we didn't have much time to make/eat breakfast - so what a perfect opportunity to make a french toast casserole! Butter the bottom of an 8x8 or 9x9 baking pan. Break up the bread into bite sized pieces and place in the pan. Add the raspberries and mix with the bread. Add in the milk to the eggs and mix well. Pour the egg mixture over the bread. Press down slightly. Cut the cream cheese into small bits and sprinkle over top of the bread mixture. In the morning, preheat oven to 350. Uncover the baking pan, place in oven, and bake for 30-35 minutes. Remove from oven, serve with maple syrup and enjoy! This recipe was a hit with our guests. One of them didn't even like raisins and said that they still liked this breakfast.